Oxfordshire U25’s will play Kent CBA Under 25s in the Junior Home Counties League on Sunday 2nd August 11.00am at Kidlington Bowls Club. It was a case of glasses, cars, alarms and rain as Oxfordshire Under 25s prepared for their Junior Home Counties League game against Bucks at Iver Heath on Sunday. Firstly skip Shane Cooper withdrew with a badly cut hand from a glass breakage and then Brandon King’s transport broke down along with Joe Woodward’s alarm clock meaning a few last minute team changes and only eleven players taking the green in torrential rain conditions. Needing all ten points to stay in contention for the title (Surrey are guaranteed six points from their last game as Middlesex have withdrawn from the league) Oxon settled to the task well and, with the green in danger of being submerged, led on all rinks with thirty ends played. Thirty ends constitutes a game and so had it ended then maximum points would have been awarded but the weather had its own ideas though and the rain slowed considerably shortly afterwards meaning the whole game being played. Captain George Schwab in what could be his last JHCL game with Jonathan Dadson playing his first at lead with Harvey Alder and Orren Bennett in the engine room controlled their game against the four of Jack Seagrove from the off and picked up a hotshot eight on the fourteenth end to effectively end their encounter as a contest. The four continued to score well and eventually ran out winners by nineteen shots. Gary May, also playing his last game in the league, found himself skipping a triple with the two Dans, Swanson and Wakeman playing before him. Under the league rules the three would be deducted 25% of the final score meaning that they had to keep outscoring their opposition skipped by Phil Gregory. They did just that engineering nineteen shots in the last six ends to win 31(23.25) -13. The tightest of the three games was Chris Gilkes with Sam Watts, Joe Glenn and Ben Dickson against Nathan Harvey’s rink. Whilst the rain fell the game was close with never more than three shots between the sides however, once the conditions changed the Bucks front end adjusted the quicker and put Oxon under pressure end after end leading to eleven shots being scored in three ends to open a gap which could not be breached despite the Oxon four winning eleven ends to ten overall. 15-23 was the final result meaning, what would normally be a cause for celebration, a 70.25 to 49 shot and 8points to 2 victory. Nevertheless, the team, despite the disruption, performed very well in difficult conditions to secure the victory over a good Buckinghamshire side. Oxon can now secure second place in the league with a victory over Kent at Kidlington on Sunday 2nd August. With only two more week of the season to go, this week is more about clubs than individuals, as some promotion/relegation issues were resolved while others remain close affairs. With the demise of The Oxford Bowls Club, there will be 27 or 28 teams in next years league. (Oxford University Press tell us that they will be back next year, hence the uncertainty.) That being the case, the league will run as four divisions of seven teams in 2016. That means that for this season the bottom two teams in Divisions 1 and 3 will be relegated, but only one team will go down from Division 2 plus the loss of The Oxford. Promotion will be as normal, two up from Divisions 2, 3 and 4. This will give us seven teams in each division in 2016, assuming OUP do return. In Division 1, whilst a win for City and County against Bicester, has probably kept them in the division next season, the loser are relegated. In an otherwise close match, Alan Ley’s rink’s twenty-five shot winning margin guaranteed the home club the victory they needed. West Witney pushed Headington a close as any side has this year. Honours were even at eleven ends but the home side were too strong in the second half of the game and ran out six nil winners. The loss means that West Witney will join Bicester in Division 2 next year unless all the remaining fixtures go their way. Shiplake went a long way to ensuring their safety with a very comfortable victory against a weak Banbury Central, for whom the match meant little, as they were secure in third place regardless of the result. Jim Bland’s rink scored sixteen without reply whilst Barry Lambourne’s outstanding performance won what otherwise was a very close game. Division 2 is giving us another nail biter! Just as last year, promotion will go to the wire. After this weeks results, any of the top four can gain promotion, though Thame are relegated. Best result of the week, anywhere in the league, goes to South Oxford who defeated league leaders Witney Mills five – one. No individual rink to pick out just good bowling by all with South Oxford winning on three rinks. Adderbury cemented their promotion hopes with another five – one, whilst relegating Thame in the process, Tom Clarke and Phil Gladden’s men doing the damage for Adderbury. The final match saw Charlbury winning a very close affair against The Oxford Bowls Club. The promotion race is as follows: Witney Mills have one match to play, against The Oxford Bowls Club, who will be playing their last ever league match! Adderbury, with one to play, meet promotion rivals Watlington next week! Watlington’s final match is against Charlbury whilst South Oxford play The Oxford and Thame in the final two fixtures. It could go to shot difference! Division 3 leaders, Witney Town, need one point to ensure promotion despite their surprise loss to Kidlington, for whom Melvin Brain’s rink stood out. Town’s next match is against second place Banbury Chestnuts, who kept themselves in the promotion race with a five – one victory at Headington. Chestnuts finish their season at home to the third team in the promotion stakes, City and County, who were themselves having a comfortable five – one win away at Chadlington. In the relegation battle, Bloxham now look doomed having lost to Chipping Norton, who may have saved themselves with the win. Chipping Norton still have to play fellow relegation contenders Chadlington and Headington B in fixtures that will decided who joins Bloxham in Division 4 next season. Promotion from Division 4 has come down to one match. A good win for Banbury Central this week, at home to West Oxford, means that third place Blackbird Leys are at home to second place Central next Thursday knowing that they must get a win to give themselves a chance of promotion. Big wins for Tom McKenna and Ron Cox’s rinks were the basis for Central win whilst Leys had a bye. Leaders Hanborough were getting an expected whitewash of Florence Park, achieving the only century shot total in the league doing so but they only have one match to play and Central could still overtake them. Woodstock were defeating South Oxford B in the final match in the division with Brian Clarke’s rink providing the required shots for the match points. In it’s new format and celebrating it’s 70th anniversary, this years Bradshaw Cup took place on Sunday afternoon at Banbury Chestnuts. A team of players from clubs in the North & West of the County were up against bowlers from clubs in the South & East. The North & West team ran out winners by 122 shots to 108 even though the South & East won 4 rinks to 2. The Chestnuts green stood up well to the rain that had prevailed for most of the day, and the bowlers and their guests, as usual, were treated to the clubs warm hospitality with a welcoming roast dinner after the game. Brian Bloomfield (Witney Town) 14, Mark Charlett (Headington) 30. Watlington Bowls Club is hosting the 8th Oxfordshire Bowling Association & Bowls Oxfordshire Ladies Under 25s day, on Monday 31st August 2015 at 9.30am. All Under 25s players in Oxfordshire are invited to come and take part in what has proved one of the most popular days in the bowling calendar over the past few years. Experience is not necessary. If you are aged under 25 and play bowls then you are qualified to take part or even if you haven’t played bowls and want to try you are equally qualified, so come along and get involved. All you need is flat soled shoes or trainers and enthusiasm. In addition to the bowling there will be spiders and bowl for goal competitions. There is no cost to players with lunch and a drink provided. Parents and spectators are just as welcome. There will be bacon rolls available on arrival, a barbecue at lunchtime along with bar and refreshments all day. In addition to this, the men’s Under 25s double rink have qualified for the national semi-final of the White Rose 2x4s and play Devon at Leamington on Sunday 30th August 2015 at 9.30am. The ladies Under 31s take part in the Amy Rose at 9.30am the day before on Saturday 29th August 2015. Please get along to support both teams if you’re able! Carterton club President Phil Monahan, welcomed OBA President Steve Tolhurst to his home green for this year’s Oxfordshire County National Championship finals. As most bowlers in Oxfordshire know, it is not possible to play at the club without noticing the RAF undergoing their daily routines, and wondering as to how such gigantic machines not only get off the ground but manage to stay up in the air. The big machines lifted off as the days proceedings were starting, followed at intervals throughout the day by aircraft in the sky that were appearing at the nearby Fairford Air Tattoo, and culminating with a fly past from the Red Arrows. Whilst all this was taking place, the main event, and the reason why the many spectators had come from all corners of the County, was the contests taking place firmly on the ground to find the 2015 County Finals winners. The morning session saw the finals of the Pairs, Fours and Under 25 singles. The Pairs brought two Headington pairings up against each other, Howard Watts (in the first of three finals) with lead Jon Philpott, with Ian Henwood leading for Mark Charlett. As expected from the four club mates, the game produced a tight encounter and after eleven ends the teams were level at 11 all. After sixteen ends only three shots in favour of Philpott and Watts separated the duo’s, but a conversion by the leading pair on the next end led to a three and a lead of six shots. This proved to be the killer blow and was followed up by a two and a brace of singles to give Philpott and Watts a 23-13 win. Watts, played one, won one. The host club had three members featuring in two of the days finals, and they were on a high after beating Gerrards Cross the previous day, in their quest to reach the finals of the National Top Club competition. Two more games to go and we wish them all the best. The three, Andrew Martin, Stuart Richens and Paul Sharman were joined by Tim Jupp at lead for their Four’s encounter with the Banbury Borough rink of Keith Holloway, Richard Redford subbing for Jamie Wilkinson, George Schwab and skip Mark Sykes, who was also featuring in the singles after lunch. The home foursome went off on a flyer and were 8-2 up after the first five ends, before their opponents overcame their jet lag, having travelled all the way from the north of the county, and picked up ten shots over the next five ends to move into a 12-8 lead. Although they took four of the next six ends, the Carterton four were still one shot down at 15-16 but then they picked up a four on the seventeenth to move into a three shot lead which they increased to seven at the twentieth at which point the two sides shook hands with the scoreline of 23-16. Martin, Richens and Sharman, played one, won one. Starting 30 minutes after the Pairs and Fours, Headington’s Dean May and Watlington’s Sam Watts (defending his title), contested the Under 25 Singles final. The Headington man must have felt confident after he kicked off with a three on the first end, but title holder kicked into gear picking up thirteen shots without reply over the next six ends. A pair of two’s and singles brought May to within four shots before losing three of the next five ends to enter the seventeenth end 12-18 down. Three ends later he had closed the deficit to two shots and started to have the upper hand with Watts hanging in and keeping the shot count against him down. Two Singles brought Watts to within one shot of the title and a lead of four at 20-16. Longer jacks were proving to be in May’s favour and he held counts over the next three ends and even reached a position of holding game only for his opponent to pull out a wood to contain the challenger to three singles and still 19-20 behind. The twenty-fourth end brought the game to a dramatic close. With Watts holding shot, May, with two woods within four inches of the jack to Watts’ shot wood within three inches, the Headington man rattled the head only to see Watts’ wood finish nearest the jack and give him a 21-19 win. After such a fight back from his bad start, and taking 13 of the 25 ends played, it was an unfortunate way to lose for May, in his last year of qualification for the competition. In total contrast to last weekends semi-finals when lunchtime beckoned rain, after refreshing themselves from the clubs fine selection of lunchtime treats, bowlers and spectators returned outside to be greeted with glorious red hot sunshine. The Singles and Two-wood Singles kicked off the afternoon session and it was noticeable right from the start that during the lunchtime break, the introduction of the hot sun had made the green considerable faster. This was very noticeable in the Two-wood event, where both contestants, home club bowler Stuart Richens and Headington’s Howard Watts were into their second final of the day. After losing two singles the Carterton man dropped on his weight and proceeded to take the next five ends for an 8-2 lead. Watts, who was struggling on the faster green, could only pick up three singles to his opponents seven shots over the next seven ends and at 5-15 down after fourteen ends he needed to pick 6 doubles from the last seven ends to stay in the game. Two singles to Richens on the next two ends gave him a 17-5 victory and his second title of the day. Whilst Richens was in the process of taking his Two-wood title, Mark Sykes, who had won the same event ever since its inception three years ago, was representing the Banbury Borough Bowling Club in the Singles Championship against another double finalist, the newly crowned Under 25 Singles Champion Sam Watts. Sykes adapted to the quicker green the soonest going 6-0 up after four ends, moving on to a 10-2 lead after ten. Watts started to come into the game more, but was being held to single shots and after nineteen ends was 8-17 behind and knowing his opponent was close enough to take the title on any end. A 1,2 and 3 brought the Watlington man to within four shots before Sykes collected a brace of two’s to clinch the title 21-14. Howard Watts, won one, lost one, entered his last final of the day alongside his winning pairs partner Jon Philpott with Nathan Lewis joining them at number two against the mornings Fours winners from Carterton, Andrew Martin and Paul Sharman who were joined by David Clanfield at lead. Clanfield and Sharman made up two-thirds of last years National Triples losing finalists. After five ends, only two shots separated the trio’s with the Headington triple leading 7-5 but then a two followed by a six in their favour shot them into a ten shot lead. A two to Sharman and his team on the eigth closed the gap to 8 shots but this was the last time they would challenge their opponents who kicked into another gear picking up 13 shots over the next six ends at which point the Carterton lads put their undercarriage down and brought things to a halt as Watts and Co. landed a 28-7 win. The Carterton club had done their County President well. Their hospitality to both players and spectators was excellent. The Finals had been played in the right spirit and the spectators had been treated to some fine bowling. Thanks go to the umpire Jim Bland who was kept busy throughout the day. With three weeks of the season left, the chase for promotion and the late drives to avoid relegation are starting to have their effect in matches. In Division 1, Headington maintained their leading position with a narrow defeat of closest rivals Carterton. Indeed, only the size of the wins for Howard Watts and Jason King’s rinks separated the clubs. Elsewhere, Banbury Central were deflating City and County with what at first sight, appears to be a big win. However, the visitors were leading at sixteen ends, and only a fight back by Les Campion’s’ men from twelve shots down after thirteen ends to five down at the finish, against an ultimately victorious Alan Ley rink, swung the match in Central’s favour. City and County’s defeat leaves them deep in the relegation battle. What may save them is their upcoming fixture against Bicester, who were almost certainly condemned to relegation with their loss at the hands of West Witney, for whom Kevin Alder completed a topsy-turvy week with a good win. The top of Division 2 remains as tight as ever. Leaders Witney Mills had the rinks skipped by Allan Wiggins and Chris Weller to thank for their victory over Charlbury but still dropped a half point to chasers Watlington, for whom Bob Gilkes provided the icing on the cake in their defeat of Thame. Adderbury maintained their third place, but lost ground on the leaders, in their match at The Oxford Bowls Club. The large shot count difference in the match was entirely due to Chris Skidmore’s win. Relegation to division 3 may well be decided by the match between Charlbury and Thame in two weeks time. In Division 3, Witney Town appear to be cruising towards division 2. This week they inflicted Headington B with their biggest ever league defeat, by fifty-two shots, whilst their only real chasers were both losing at home. Seventy-nine of their one hundred and fifteen shot total in the match with Headington came from the rinks skipped by Alan Scholan and Tim Ludlow. Banbury Chestnuts somewhat surprising home defeat by Chadlington was largely due to the rink of Phil Radbone whilst City and County’s even closer affair went Bloxham’s way thank to Tony Gardner and Ron Higgins’ men. Kidlington’s defeat of Chipping Norton eases their relegation worries whilst increasing those of the losers. John Hardies’ rink was the highlight for the winners. Although the promotion race may well be almost over, that for relegation is closer than ever and any two of the bottom five clubs can still go down! The Division 4 promotion race is now the closest anywhere in the league. Comfortable wins on three rinks against the leagues bottom side, Florence Park, enabled Blackbird Leys to move to within one point of Central in the competition for second place. Central still have three matches to play whilst their close rivals only have two each! The final match was the closest in the league this week. Gary Richardson’s rink must have thought that they had done enough to take the match points for West Oxford only to see their eleven shot winning margin overturned by Ron Collett and Brian Clarke’s rinks for Woodstock. The ladies Blay cup & plate was played at Henley on Saturday 18th July on a hot sunny day, the final of the Cup was a closely fought game won by lead Janet Fountain and skip Pat Ostler of Banbury Borough by one shot against lead Eloise Jones (Banbury Central) and skip Jeanette Berry (Oxford City &County). 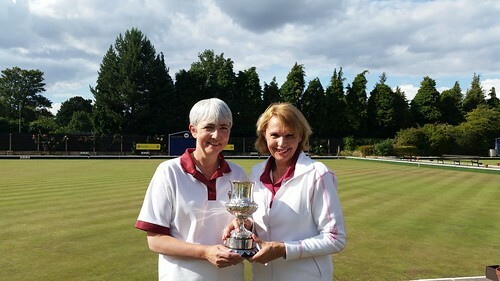 The Plate final was won by Erica Brown (Banbury Borough)and Sylvia Blackmore (Shiplake) who played Ros Sopp (Bloxham) and Myra Lewis (Oxford City & County). The day was supported by 26 Entries and raised £179 for the Blay fund, £90 of which is paid out in prize money, a very sucessful day for all and a big thank you to Henely ladies for their continued support throughout the day. Final: Pat Ostler & Janet Fountain 12, Jeanette Berry & Eloise Jones 12. Semi Finals: Sylvia Blackmore & Erica Brown 15, Val Rees and Kay Oliver 4; Myra Lewis & Ross Sopp 12, Maureen Osborne and Ruth Copp 6. Final: Sylvia Blackmore & Eric Brown 9, Myra Lewis & Ross Sopp 5.